I have been and still am a loyal customer of Chimara's flagship store in Greenbelt 3. It's our go-to place and default companion whenever we watch movies in Greenbelt. We never miss out on bringing a bag of Chimara's heavyweight sour cream popcorn in theaters, even when we just had lunch or dinner. Another favorite of mine is Chimara's tofu chips! I'd say that Chimara/Taters' tofu chips is the best I've had so far. 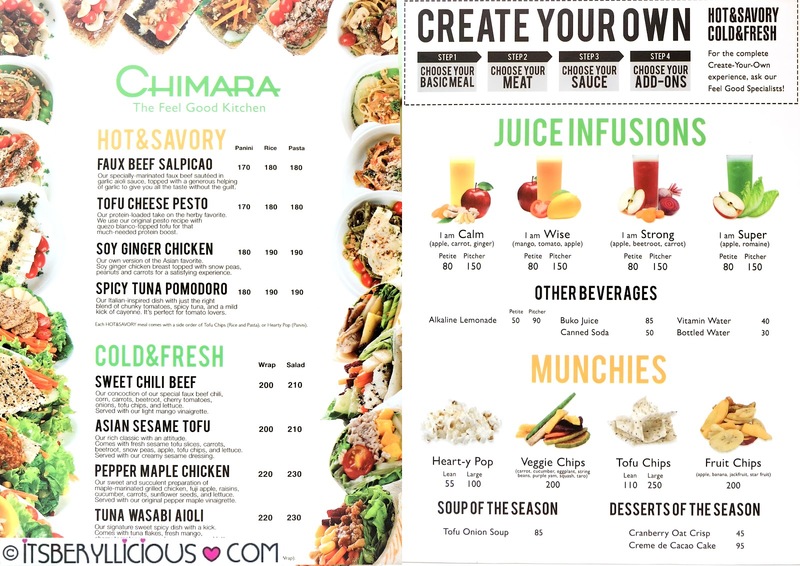 Chimara started out as a neo-vegan cafe in 2002 offering healthy food alternatives to the emerging health-conscious market. 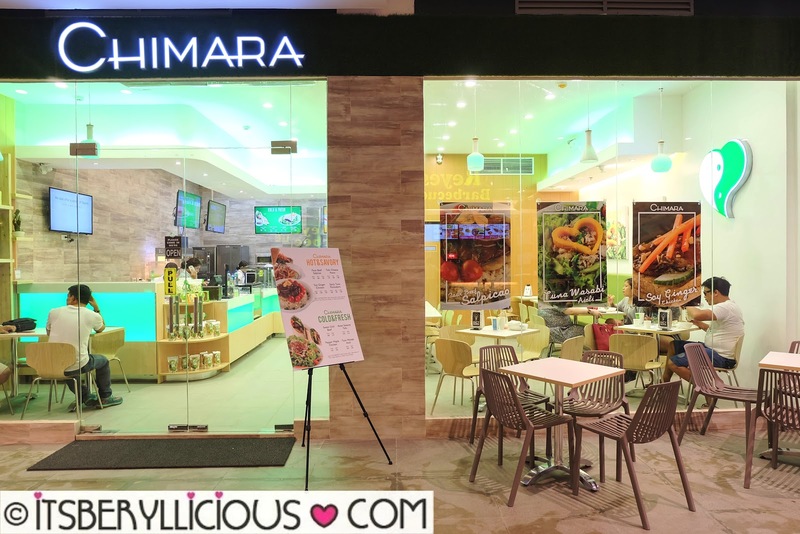 This year, Chimara reinvents iteself as a "feel good kitchen", to promote a feel good lifestyle that gives its customers the freedom to be healthy at their own pace. Just recently, Chimara Feel Good Kitchen reopened its branch in UP Town Center Katipunan where customers can sit down and enjoy their meals. It's a different approach to their previous branches where customers just order their meals and snacks to-go. 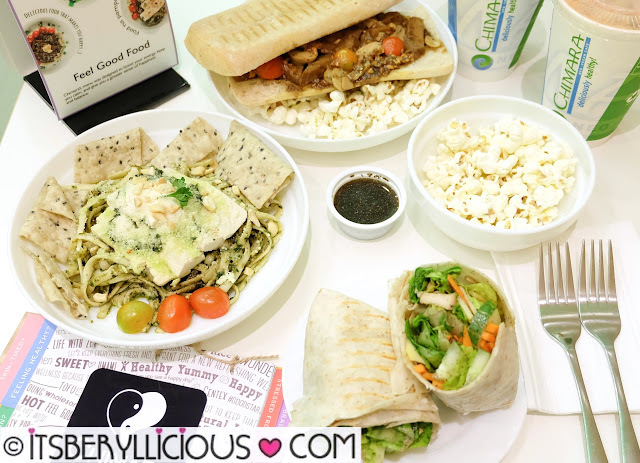 We checked the new developments in UP Town Center and decided to drop by Chimara Feel Good Kitchen for a quick afternoon snack. 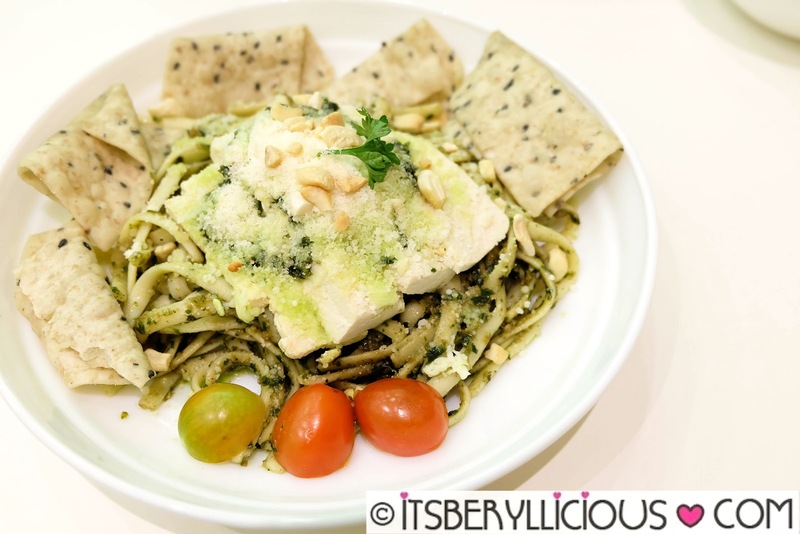 The Tofu Cheese Pesto Pasta is a protein-loaded dish of fettucine in pesto sauce, topped with tofu slices, quezo-blanco cheese and nuts. I like the fresh and herby tasty of the pesto, while I also enjoyed munching on my favorite tofu chips which comes in every order of Chimara's hot and savory pasta dish. This panini features Chimara's specially marinated faux beef sauteed in mushrooms and tomatoes in garlic aioli sauce. Of course it didn't have that beefy taste and texture of real beef slices, but flavor-wise, it was surprisingly tasty. 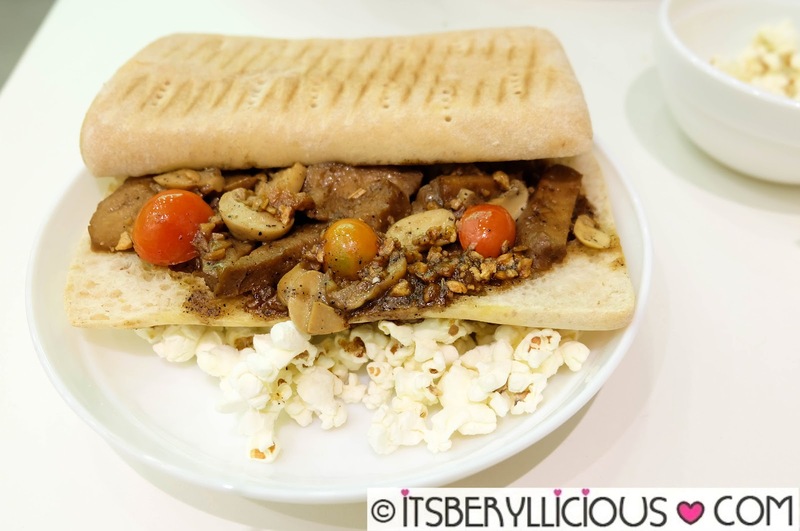 Every order of panini comes with a side of Chimara's hearty popcorn. For a cold &fresh selection, we opted for a wrap instead of a salad. 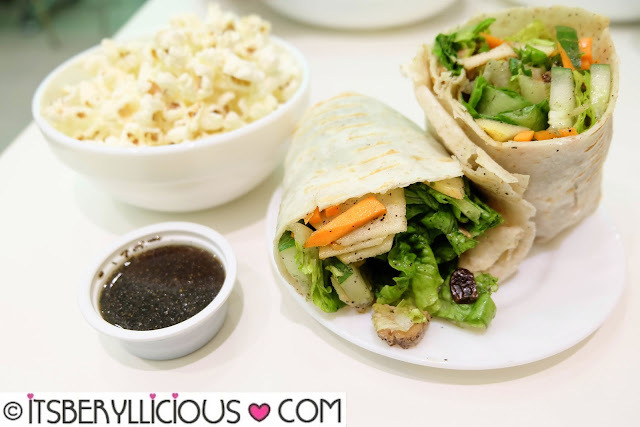 The Pepper Maple Chicken wrap is a sweet and succulent preparation of maple-marinated grilled chicken, fuji apples, raisins, cucumber, carrots, sunflower seeds, and lettuce, served with Chimara's signature pepper maple vinaigrette. Every order of wrap comes with a side of hearty popcorn. 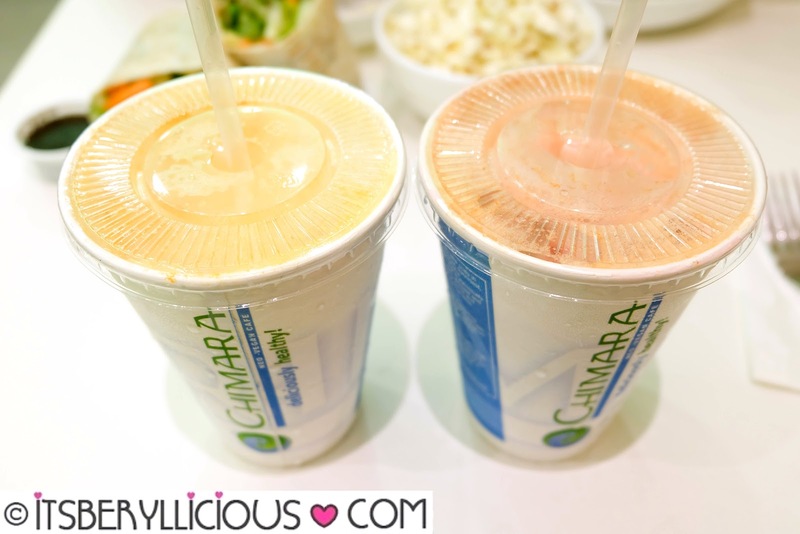 For drink, Chimara Feel Good Kitchen serves healthy and refreshing juice infusions to target specific concerns. We got the I Am Calm (apple, carrot, ginger) and I Am Strong (apple, beetroot, carrot) (P80/glass, P150/pitcher). I was never a fan of those"juice cleanse" because I prefer eating my veggies than drinking them. Chimara's juice infusions were sweet and light tasting, perfect for people who plan to start juicing diets. I'm looking forward to visiting Chimara Feel Good Kitchen again and try other healthy dishes they offer. Of course, will definitely drop by to buy a bag of tofu chips should we plan to watch movies in UP Town Center soon! Chimara is a feel good place for a delightful meal with the guilt! 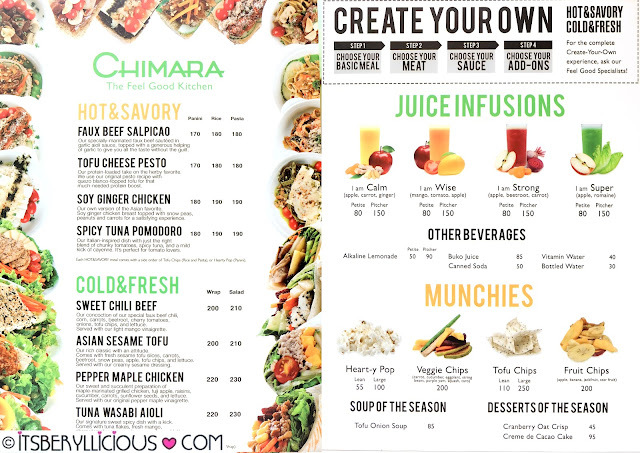 Finally, I can now sit down and enjoy my favorite Chimara snacks with their fresh and savory menu items.